English: Madame Rabourdeau at her first lesson. 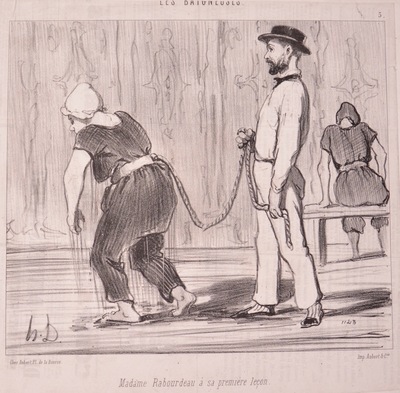 Daumier illustrates the apparatus that nineteenth century French swimming instructors used to teach their pupils to swim—a necessity in order to maintain propriety in an era when co-ed swimming was frowned upon. The rope and harness allowed male teachers to keep their female students afloat without having to enter the water with them or make any physical contact. Henry Emy illustrates the device in use in the lithograph to the left.